As cloud computing matures, it’s increasingly vital that enterprise IT decision-makers understand the potential advantages of utilizing IaaS solutions such as Microsoft Azure. 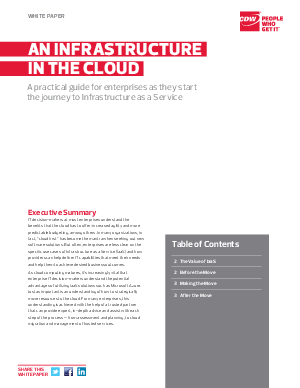 Just as important is an understanding of how to strategically move resources to the cloud. For many enterprises, this understanding is achieved with the help of a trusted partner that can provide expert, in-depth advice and assist with each step of the process — from assessment and planning, to cloud migration and management of hosted services.